You can make the most of even the smallest pieces of leftover meat on your holiday turkey. I simmer the bones to get the rich flavor, then easily remove any meat that remains. 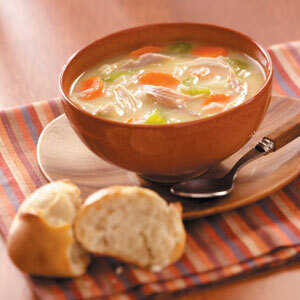 I add rice, vegetables and cream soup for a hearty turkey soup that's tasty and economical. Place the turkey carcass in a stockpot; add the water, onion, salt and bay leaves. Slowly bring to a boil over low heat; cover and simmer for 2 hours. Remove carcass; cool. Strain broth and skim fat. Discard onion and bay leaves. Return broth to the pan. Add the carrots, rice, celery and chopped onion; cover and simmer until rice and vegetables are tender. Remove turkey from bones; discard bones and cut turkey into bite-size pieces. Add turkey and half and half to broth; heat through. Yield: 8-10 servings (about 2 quarts).